Most people coming into my Los Angeles sports chiropractic office with numbness and tingling of the hands and fingers believe they have carpal tunnel syndrome. Interestingly, many of them have been told that by a doctor. The problem is that they are being told it’s carpal tunnel syndrome, even when it is not. So let me help: Carpal tunnel syndrome is a paresthesia of the median nerve; as a result it is felt as numbness and tingling in the first three digits of the hand–the thumb, forefinger and middle finger (see picture on right). Numbness and tingling in the last two digits (ring and pinky fingers) is NOT carpal tunnel syndrome. I will trust that my clients who tell me their GP has diagnosed their 4th and 5th digital numbness as carpal tunnel syndrome just misunderstood what the doctor was saying, because I know the good doctor would not say that…right, doctors? Right? OK, numbness and tingling in the last two fingers is called cubital tunnel syndrome, and it involves the ulnar nerve. If you are reading this and you currently have numbness/tingling in your hand(s) or fingers, please visit your local sports chiropractor’s office. If you live in Los Angeles, Beverly Hills or West Hollywood, chiropractic is just a phone call away. 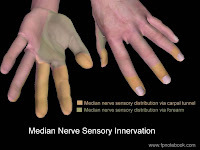 As a gift, watch the video below to learn one way to beat carpal or cubital tunnel syndromes. And then call your sports chiropractor–no need to suffer. Any idea how to relieve numbness in the hands when riding the bike? The numbness always goes away when I stop, but but no matter how I try to take the pressure off my hands, they just go numb from holding on.